Product Summary: Though this product had an ominously thick lather, it turned out to be a mild shampoo that I would use again (but probably less of it when I do). Update 3/18/2017: When I went over all the ingredients in this product, I was concerned about the sodium lauryl sulfoacetate, because one ingredient book when you look it up directs you to sodium lauryl sulfate, which is really harsh. However, I didn’t find much about sodium lauryl sulfoacetate itself. So I almost didn’t want to try this shampoo, but I thought about how the first ingredient is sodium lauroyl sarcosinate. Which is known for being so gentle that it can’t clean anything too heavy on its own. 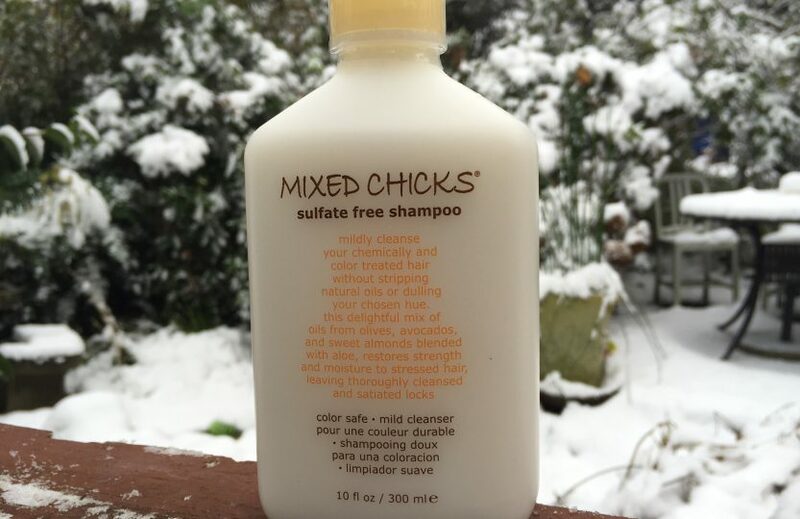 And also, it wouldn’t make sense for Mixed Chicks to set out to create a harsh shampoo, even though companies do all the time. So I decided to give it a try. I’m glad I did. At first, when I was lathering, it made a really hard lather. The kind of lather that while you’re using it, you’re thinking, uh oh. This is going to strip my hair. Luckily I only use shampoo on my scalp, never on the rest of my hair, so my ends were safe. But I was really nervous as I was using it. It felt like the over-lather quality of dish washing liquid. I nervously rinsed it out of my hair, and was pleasantly surprised my hair still felt moisturized. So it looks like they put in a really heavy dose of lathering ingredients (lathering and cleansing are often two separate things. Something can clean without lathering, and some products can lather without actually cleansing). Despite the possibly harsh sodium lauryl sulfoacetate, the sodium lauroyl sarcosinate saved the day and kept the product gentle. I would use this product again, now that I know not to worry about the copious lather. So I’m going to change the status of this from “In Progress” to letting it live with all the other recommended shampoos. 12/13/2016: I found this at the same Rite Aid in Louisville as a bunch of other cool hair products I’ve been posting lately. Just sitting there on the shelf like it was no big thing. I glanced through the ingredients, looking for anything that jumped out at me as bad. For Mixed Chicks I also keep an eye out for acrylates. To my happiness, this didn’t have any. And everything else of first glance looked good, so I snatched it up and hopefully I’ll be trying this out soon. I got another Mixed Chicks shampoo as well, so I’m not sure which one I’ll try first. But I wanted to let you know I have this, and it’s on my list to try.